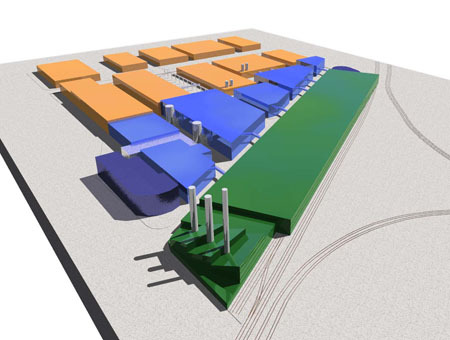 Supported by the NWDA and Greater Manchester Waste Ltd, URBED and Sustainability North West teamed up during 2003-04 to work up a concept for, and test the feasibility of, establishing a recycling-based industrial park in the North West. Activities within the park could focus on the recycling of secondary materials into high value products, potentially consisting of over 250k sq ft of industrial space with the potential to create over 1,000 'green collar' jobs. The park could be served by state-of-the-art energy and water supply systems, and a Research & Development facility would also be established as a centre of excellence in recycling – focusing on materials science, product design and process technologies. The team carried out wide ranging research and consulted with industry on the diversified activities that could be attracted to such a site - focussing on paper, plastic, metals and textiles. We also carried out a site search across Greater Manchester, and commissioned TPP transport consultants to test freight scenarios. 1) Quality Control, Storage and Distribution - high quality source segregated recyclables collected from Greater Manchester and other municipalities would be sorted, bulked and stored for reprocessing. Innovative ‘just-in-time’ sequenced logistics systems for moving the materials for reprocessing or disassembling could also feature. 2) Reprocessing - secondary materials would then be reprocessed into intermediaries - such as paper pulp and plastic pellets - which could then be used to manufacture high value products and raw materials by a range of different companies located on site. There could also be disassembly plant to obtain secondary materials from end of life products. 3) Utility Centre - the park would be served by state-of-the-art energy and water supply systems. A CHP (Combined Heat and Power) energy system would supply electricity, heat and cooling and could potentially be fuelled from waste organics e.g. biogas from an anaerobic digestor, biodiesel from waste oil. 4) R&D Incubator - a centre of excellence in recycling would be established to develop new process technologies, materials specifications, and product design specifications, potentially with support from the universities and supporting enterprise organisations. It would also require an overall management structure to co-ordinate operations and investment, and that there would need to be joint ventures between materials collectors - such as GM Waste - and reprocessors in order to lever investment into collection and sorting systems. The team made a series of recommendations to the client group as to how investment could be structured and attracted to such a project, and the concept is being taken forward on a number of sites across the NW region.